If you take a quick peak in most neuroscience textbooks you will most likely be informed that the amygdala is a critical part of the emotion-generating limbic system, that it’s activation makes events more memorable and that it’s primary role is to trigger the fear response. However during the few days between Christmas and New Year I found myself writing two separate #braintweets that described a pair of recent studies that identified a positive correlation between the size of a person’s amygdalae and high-level brain functions that, on the face of it, have nothing to do with fear whatsoever: 1) a larger social network and 2) a conservative political persuation. Here I investigate how these seemingly incompatible findings about the amygdala all fit together. I argue that, tempting as it is to draw the facile conclusion that people with large amygdalae are more fearful in general, which makes them more likely to vote conservative and to nurture a large group of allies to protect themselves , in all likelihood this is probably not the case. 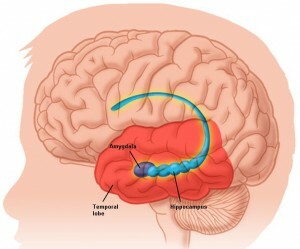 It has been known for several decades that the amygdala, an almond-shaped cluster of highly interconnected brain cell nuclei deep within the inward facing part of the left and right temporal lobes, are very important in the generation of fear. Ever since fairly barbaric surgical procedures carried out in the 1930’s to see what happens when the temporal poles were removed (including the amygdalae) the most obvious consequence was that the animals lost their fear of the human experimenters. They also over-reacted to all stimuli, showed an increased propensity to exploring objects with their mouths, and became hypersexual, as well as becoming incapable of producing the standard usual responses to danger, such as freezing, increased heart rate, hair standing on end etc, that usually occur in response to an overpowering and unexpected occurance such as a loud bang. 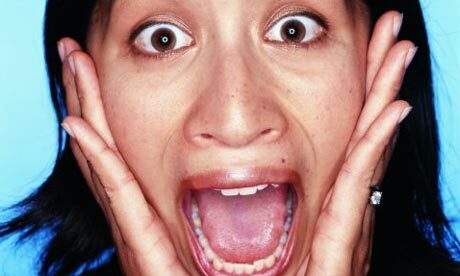 Since then many brain imaging studies have gone on to demonstrate that the amygdala is also highly responsive to fearful facial expressions (Sato et al, 2010, for a recently published example). Presumably this is because if another human is scared, it is advantageous for us to also generate feelings of fear, thus encourage behaviours that might also help us to evade the fearsome agent. Interestingly the neural mechanisms involved in making you feel scared when you lay eyes on the face of a petrified individual implies a multi-step process that includes: 1) accurately identification the emotion that they are experiencing AND then 2) generating this emotion in your own mind. This quite possibly invokes the dual phenomena of expression mimickry and the facial feedback hypothesis: we all have a curious tendency to copy the facial expressions of the people around us and the proprioceptive detection of this facial expression is thought to then trigger the feelings and potentially life-saving behaviours associated with fear. A similar sequence of mechanisms is involved when you see a smiling face – you tend to smile yourself and the smile makes you feel happy. 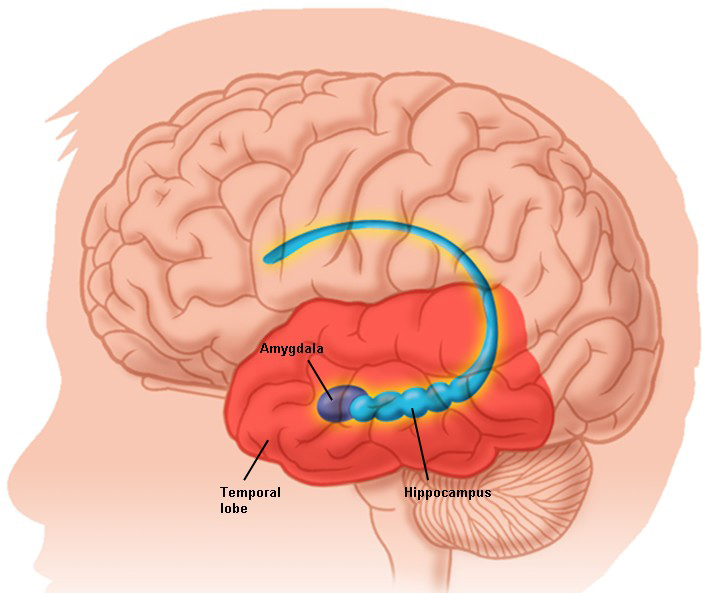 Beyond fear – what else does the amygdala do? An fMRI experiment I did during my PhD studies investigated which human brain areas were sensitive to the relative synchrony between visual and auditory stimuli. Despite there being nothing particularly emotional (and certainly not fearsome) about a pair of visual stimuli that each rotated synchronously with a different characteristic sound, to my surprise I discovered that this multisensory synchrony produced strong activation of the amygdala (unpublished observation). 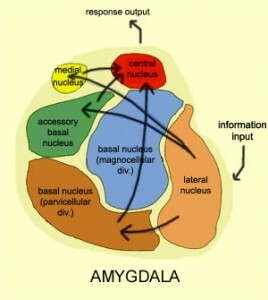 Reading deeper into the amygdala literature I soon discovered that far from being a single functional unit it is in fact a cluster of several different brain nuclei, each highly interconnected with a different groups of brain regions and also highly interconnected with each other. Meta-analyses of many different brain imaging studies revealed that the amygdala is activated in response to faces displaying a whole range of different emotions including positive emotions and not just negative emotions such as fear (Phan et al., 2002). A recent publication has demonstrated a positive correlation between the size and complexity of a person’s social network and the size of their amygdalae (Bickart et al, 2010). The suggested explanation for this correlation is that “a larger amygdala might enable us to more effectively identify, learn about and recognize socioemotional cues”. No suggestion that, of the 58 people whose brains were scanned in this study, those with the larger amygdala were the biggest scaredy cats. The question of which of them were the most timid simply wasn’t asked. Geraint Rees, Director of UCL’s Institute of Cognitive Neuroscience, speaking on a recent BBC radio show, described an experiment due to be published next year (assuming it passes the peer-review process) that observed a positive correlation between amygdalar volume and conservative political views. This would be a step forward from a recently published paper that indicated increased activation of the amygdala when politically-interested participants read statements that agreed with their own political views (Gozzi et al, 2010). It is difficult to see how the results of all these different studies might fit together in terms of a universal theory of amygdala function but the most parsimonious explanation is that different amygdalar nuclei each fulfil different functional roles. Some nuclei directly influence the hypothalamus to orchestrate the increased heart rate, breathing rate and freezing behaviour characteristic of the fear response. Other nuclei well connected with visual and auditory brain areas may direct attention to multisensory phenomena that change simultaneously. And yet further subdivisions of this complex brain structure may be involved in learning and using the critical social cues that help us to form allegiances with other humans, both on a personal and political level.